Agricultural? Community? Environmental? Family? Food? Garden? Youth? Need more answers? Click here to learn more about Purdue Extension. ​"Quality Products Fulfilling Your Landscaping Needs"
Here is just a small sample of what we offer. Please visit our showroom and/or give us a call. These are high quality cast aluminum yard structures. Take a quick tour of our aluminum yard art and furniture. We have a huge variety of yard art animals, fountains, urns, street lamps, mailboxes, wall hangings, statues, and more. Come on in and you can decorate your landscape as many of your neighbors have already done with our fine aluminum outdoor/indoor products. Glassblowing is a glassforming technique that involves inflating molten glass into a bubble (or parison) with the aid of a blowpipe (or blow tube). A person who blows glass is called a glassblower, glassmith, or gaffer. Handcrafted Cohasset molten glass art. Watch the video to see the creation of these fine pieces of art are made. Contact us or visit our showroom and purchase your Cohasset Molten Glass bowls today. 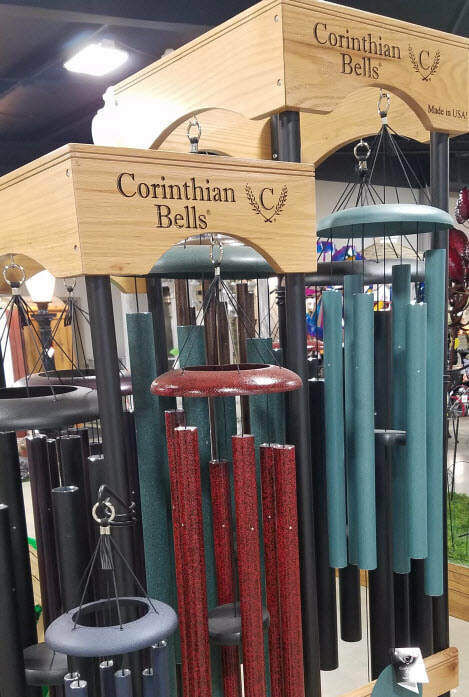 We sell high quality wind chimes, Corinthian Bells. Made in the USA. Visit our showroom and listen for yourself.